Blonde Like Me: The Roots of the Blonde Myth in Our Culture (Paperback) | Eagle Harbor Book Co. In this irreverent, unsparing, and witty look at our cultural obsession with blonde, Natalia Ilyin shows us that our apparently modern fixation has truly primeval roots. Highlighting cultural criticism with personal experience, she cites ancient myths, Hollywood iconography, and the daily assault of advertising to reveal why the allure of being a blonde has crossed the boundaries of ethnicity, economics, and age. In essence, she shows us the difference between simply having blonde hair and being a blonde. Natalia Ilyin has taught courses in American mythic images at Cooper Union and Yale University. She lives in New York City. Natalia Ilyin takes a premise as wispy as a strand of baby blonde hair and weaves it into a surprisingly rich and entertaining tapestry. 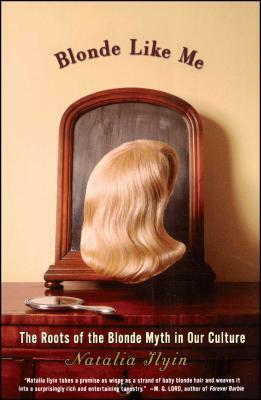 Mix one part Robert Graves, one part Fran Lebowitz, and one part peroxide, and you get this scholarly, slyly funny, and deliciously readable exploration of the ultimate, and not-so-ultimate, meaning of blondeness. Funny -- and helpful to those of us who have spent much of our lives trying to puzzle out the insufferable appeal of blondes. Natalia Ilyin forever puts to rest the theory of the "dumb blonde." This very witty, very wise book reads as if Mae West, RuPaul, Princess Diana, Carolyn Bessette Kennedy, and I all had Freud on the couch and were trying to explain to him why he should "lighten up."